Buy your web hosting here or the planet gets it! GreenGeeks isn't a great web host, but its shared hosting plan is decent, and the 300% renewal energy investment is the best we've seen on the green-friendly front. Go shopping for website hosting and environmental concerns probably aren't high on your list of priorities, but maybe it's time for that to change. Web Neutral Project founder Jack Amend calculates that powering the average website produces 4,500 pounds of CO2 a year, equivalent to driving the average new car for more than 10,000 miles. Fortunately, it doesn't have to be that way. GreenGeeks eco-friendly web hosting isn't just optimized for maximum energy efficiency, the company also offsets 300% of its power usage by investing in renewable energy, which is perhaps why it tags itself as the 'World's #1 Green Energy Web Hosting Provider'. Social responsibility is great, but hosting quality is also important, and GreenGeeks gets off to a good start with its shared product. There's only a single plan, but it's absolutely crammed with features: a free domain, unlimited websites, emails, databases, web space and bandwidth, plus free SSL. You also get an integrated CDN, nightly backups, Softaculous one-click app installer, a website builder, and support via email, chat and telephone. A choice of data centers (SingleHop-owned, apparently) allows your site to be hosted in Europe, the US or Canada. That's unusual for a budget hosting plan, and could make a real performance difference if your web audience is mostly located in one of those countries. Standard prices for shared hosting start at $9.95 (£7.10) a month, but you can cut this to an introductory $3.95 (£2.80) if you sign up for three years, and a 30-day money-back guarantee gives you time to see if the company delivers what you need. GreenGeeks offers managed WordPress, Drupal, Joomla and other application hosting, but these are essentially repurposed versions of the shared plans (similar specs, same prices) and don't offer any major specialist features. If you need more power, GreenGeeks has some VPS and dedicated plans. These score in some areas – even the starter VPS supports four cores, while other hosts might give you only one – but overall they don't stand out for their price or features. We had some issues with the GreenGeeks website, as it sometimes leaves out key information. It lists a website builder in the shared hosting package, for instance, but not that it limits you to three pages. Meanwhile, the separate Website Builder plan lists a single price of $3.95 (£2.80), but we had to ask a support agent to get the full details on what this included, and hear about another two plans that the site didn't even mention. And low prices are regularly advertised without any warning that you must buy three years hosting upfront to get those deals. These kind of tricks aren't unusual, but that's no excuse, and we'd like to see more and clearer information on exactly what you get in each plan. Signing up with GreenGeeks is easy, especially if you're buying shared hosting. Whether you choose the website builder, managed WordPress or regular hosting, there's only one plan listed, and a single Get Started button to kick off the purchase process. After asking for your choice of domain – you can register one for free, or use your own – you're prompted to enter your contact information (name, physical and email address, phone number), choice of plan and payment details (credit cards and PayPal are supported). There are a few small catches to think about. If you want to keep your first payment to a minimum, you could go for the £9.95 ($13.80) monthly subscription, for instance. But do that and you'll pay a non-refundable £15 ($21) setup fee, so it's not necessarily the best option. Choose carefully. GreenGeeks hides its PayPal button behind a 'See more payment options' link, but we found it anyway, filled in the form and handed over our cash in the usual way. A post-payment web page explained that we would have to wait for our order to go through some 'internal checks' to ensure it wasn’t fraudulent, and the company would call to verify the order if there were any problems. Our order did take a little longer to process than usual, but no phone calls were required, and within 15 minutes further emails arrived with login URLs, usernames, passwords, links to support documents, and more. GreenGeeks' web account manager is simpler than most competitors, with only the basic information displayed: your contact details, a list of plans you've purchased and buttons to view more information or quickly access any service. We were interested to try out the website builder, but there was no sign of it in the interface. Instead we had to manually activate it from the support site, then watch as GreenGeeks sent us an email invoice for $0 and another message once the support team had enabled the product. It's a minor hassle, but only took a few minutes, and once activated the website builder appeared as a new product on our account manager page. Launching the builder gave us access to hundreds of templates. These weren't exceptional, but there was plenty of choice and they were very acceptable for a simple site. Each can be customized in a simple way via the drag-and-drop editor. It works, and it's easy to use, but widgets are very basic (no fancy slideshows, lightbox effects or anything else), and we suspect the three-page limit will make it useless for most people. If you really need a drag-and-drop solution, GreenGeeks also provides a second builder in SitePad. It doesn't match Wix or any of the other big names, but does offer 317 templates and a decent number of widgets and customizations. There's a far more professional alternative in Softaculous, the excellent one-click installer bundled with GreenGeeks' plans. This provides scripts to easily install WordPress, Joomla, Drupal, PrestaShop, Magento and many other big-name apps. Mastering something like WordPress will take time and effort, but it'll help you build top-quality, industrial-strength sites, and you'll be able to apply your WordPress skills with any other web host you choose in the future. Further options include uploading your website files via FTP, or adding them manually via a browser-based file manager. Whichever way you create a site, GreenGeeks bundles the excellent cPanel to help you manage it. Our account had a standard installation with options to view server status, create email accounts, manage databases, control security and everything else we would expect. There are also one or two bonus options, including integration with Cloudflare CDN. This doesn't do very much – you still have to set up your account separately, all you really get is an icon which makes it easier to access your settings – but it's still a small timesaver, and we're happy to see it included in the package. 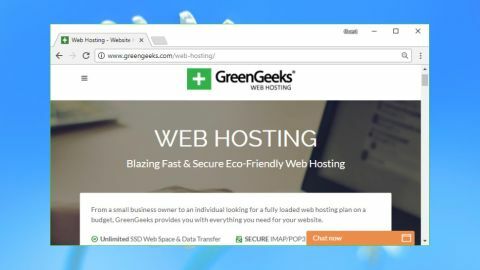 Whether you're a hosting novice or an industry expert, everyone needs a helping hand occasionally, and we were interested to check out GreenGeek's support options. The website has a support knowledgebase, but surprisingly, there are no links to it from the main account manager screen. If you didn't visit the main website, or follow some of the links in the welcome email, you might never realize it was there at all. We headed off to the knowledgebase anyway, and found around 200 articles organized into categories like Sales, General Hosting, Reseller, VPS, Billing and more. This seemed reasonable, but it didn't take long to spot a major problem: most of these articles were horribly out of date. We tried using the search engine to locate articles on various topics, but without much success. This seems to run a simple keyword search only, with no intelligence to find related articles or display them in any sensible order. The lack of technical content in the articles doesn't help, either. A search for the word Apache returned just one article: "Does GreenGeeks Support Frontpage Extensions?" Which probably isn't the question you were dying to have answered. A separate Tutorials section includes many step-by-step guides to common tasks. These are more detailed and relatively up-to-date, but cover very few standard hosting topics. They're generally more focused on setting up and managing web apps such as WordPress, Joomla, PrestaShop and more. If you can't find what you need on the website, there's 24/7 support available via ticket and live chat, and both are easily accessible from the GreenGeeks web console. We tapped the Chat button, and even though we were logged into our account, were prompted to enter our name and email address again. It's not a big deal, but indicates that the chat system isn't automatically picking up the details of our account. We were almost instantly connected to a support agent, and asked a simple product question about the website builder. His first response was to ask us to wait while he checked our account status, which also suggests that the chat system wasn't automatically showing him our account data. These delays seemed unnecessary, but they only held us up for a minute or two, and after that the agent answered our question quickly and in detail. There were occasional issues, in particular our being referred to a help URL which didn't exist, but when we pointed that out he copied-and-pasted the necessary text into the chat window instead. Overall, while we weren't impressed by the website or the support framework, the agent delivered the help we needed, and that's what really matters. As usual, we completed our tests by using Bitcatcha and some related web tools to measure server speeds. This revealed one small surprise – our Netherlands-based server had faster access from the US than the UK – but otherwise showed the kind of ordinary but acceptable performance we would expect from a shared hosting plan. Tune your website with features like the CDN and speeds are unlikely to be an issue for most users. GreenGeeks' poor website and limited product range are a concern, but the company's full-featured shared hosting plan is good value, and the 300% power offset with renewable energy is a promise we've not seen anywhere else. This could be a smart hosting choice for eco-warriors everywhere.